Of Sotheby’s numerous relationships with and lasting commitment to museums, there is one connection of particular significance: the annual Tate Britain Commission, which for the last eleven years has invited artists to respond to the vast and prestigious central wing of Tate Britain with a contemporary work. An upended fighter jet by Fiona Banner, Martin Creed's group of runners sprinting through the gallery and a giant neon constellation by Cerith Wyn Evans are just a few of the memorable past projects to have filled the Duveen Galleries, cementing this fruitful collaboration between Tate and Sotheby's — and showcasing the most intrepid minds of the contemporary art world. This year is no exception, as Anthea Hamilton takes the reins for the 2018 commission, unveiling a daring and ambitious installation that once again sees the space transformed. ANTHEA HAMILTON, THE SQUASH, TATE BRITAIN, MARCH 2018. © TATE PHOTOGRAPHY/SERAPHINA NEVILLE. Anthea Hamilton's star is rising. 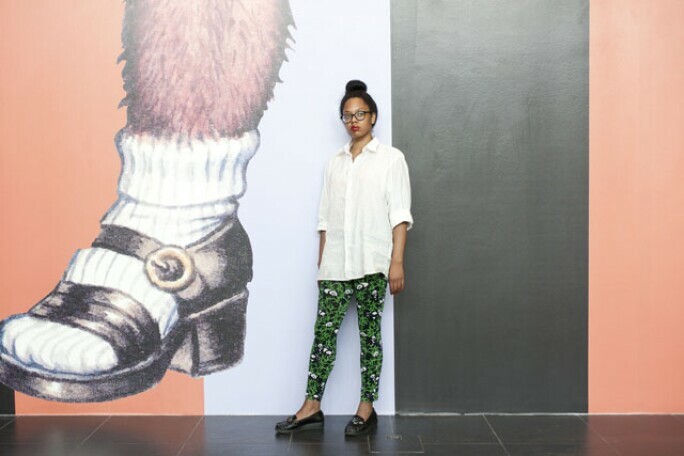 Nominated for the Turner Prize in 2016 for her exhibition Anthea Hamilton: Lichen! Libido! Chastity! at SculptureCenter in 2015, her bold structural approach to sculpture lends itself to this imposing space. The installation is inhabited by a single character — Squash, inspired by Squash Kachina of the Hopi culture — who will perform in the space for six months. 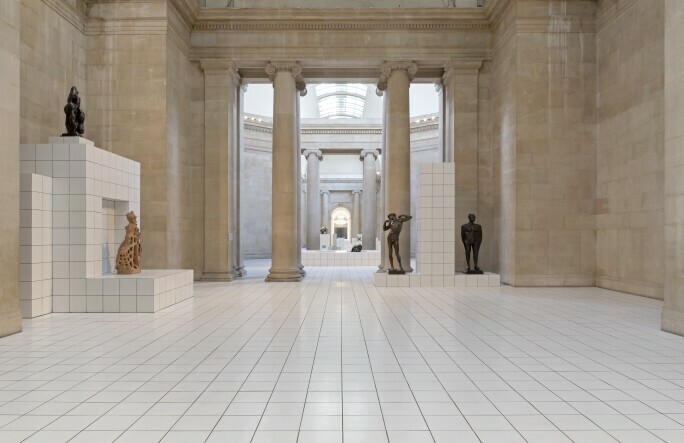 Alongside Squash, and with unhindered access to the Tate Collection, Hamilton has chosen ten sculptures from Tate’s permanent collection to display on numerous plinths, also tiled to give the impression of a grand spa or an Imperial European bathhouse, and dotted with sculptures by the greats of Modernism; Henry Moore, Bernard Meadows and François Stahly. Draped over the plinth, sometimes completely still and sometimes in motion, Squash becomes one of these sculptures, fully immersing the viewer in Hamilton’s vision. The entire space has been tiled with 7,000 ceramic tiles, laid with meticulous precision, reconfiguring this classical space in to an uniform mass of grids, and the stage on which the performance will evolve over the coming months. ANTHEA HAMILTON, THE SQUASH, TATE BRITAIN, MARCH 2018. © TATE PHOTOGRAPHYSERAPHINA NEVILLE. While all artists’ references are eclectic and diverse, Hamilton draws on a particularly unique set of references to produce her works. And she is incredibly thorough: well-referenced, and operating at the intersection of pop culture, art history and philosophy. 1970s Disco and high fashion sit seamlessly alongside Dadaist performance and 20th century Italian design. Through the course of her research and development, Hamilton meanders through vast libraries of visual material, gathering imagery as she goes and weaving new narratives from existing motifs. The 20th Century writer and dramatist Antonin Artaud’s idea of the "physical knowledge of images" is an important inspiration for the artist, and the central character of the project is based on a found photograph from her expansive archive. ANTHEA HAMILTON. © VALERIE SADOUN. The commission sees Hamilton once again collaborating with Jonathan Anderson. The two had previously worked together when Anderson commissioned three works from the artist for a show in Miami's Design District. They later appeared in conversation for the New York Times to discuss the exhibition Anthea Hamilton Reimagines Kettle’s Yard at The Hepworth Wakefield in 2016. Hamilton’s recurring character, The Squash, here played by several actors for the duration of the project, will be dressed in couture costumes designed by the Spanish design house Loewe, for whom Anderson is Creative Director. 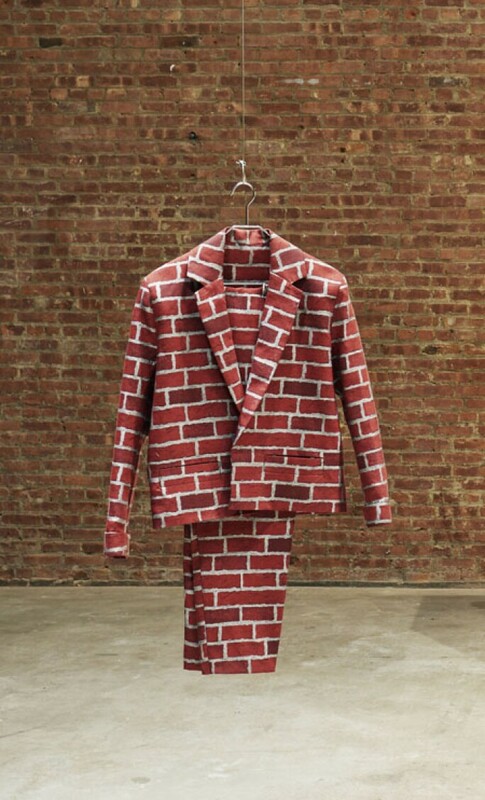 INSTALLATION VIEW OF ANTHEA HAMILTON'S, BRICK SUIT, 2010, AT SCULPTURECENTER, 2015. PHOTOGRAPH KYLE KNODELL. 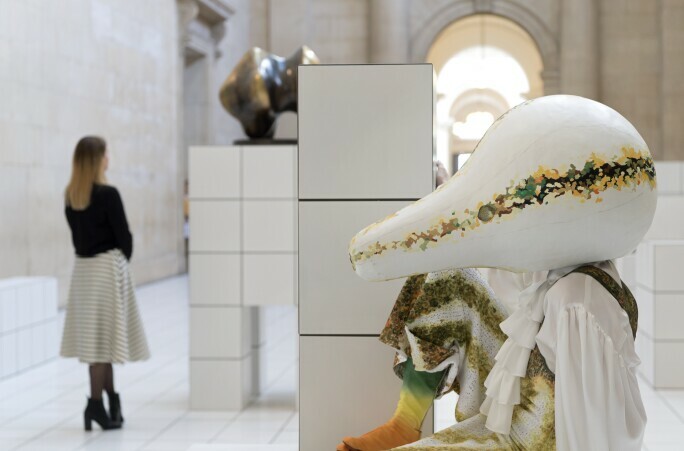 Alex Branczik, Sotheby's Head of Contemporary Art, Europe said: "Every year the ambition, inventiveness and sheer scale of the Tate Britain Commission captivates visitors ... This year, we are proud to be celebrating the eleventh anniversary of our support for the commission, which is as unmissable as ever with Anthea Hamilton's remarkable installation." His feelings were echoed by Alex Farquharson, Director of Tate Britain: "This compelling commission demonstrates her ability to seamlessly weave together captivating images and narratives, creating rich new environments in which to encounter works of art." Anthea Hamilton, The Squash, is at Tate Britain from 22 March-7 October 2018.